Video functions: The host is a product with compact design, stable performance, optionized video compressed format:H.264. It is really value for money. It is user friendly. Normally, it is suitable to private monitoring. High privacy protection function makes user use it freely. This system is compatible with many telecom protocols. front-end equipments can be controlled and managed by central monitoring system. DVR can support large capability hard disk. The video recorded can be backup by different methods. This system can be managed by public network, private network, LAN. The alarm information can be uploaded to CMS automatically. User can set system parameters, system time remotely. User can also use mobile phone with Windows Mobile .Symbian3.Symbian5, Iphone, blackberry, Android operating systems to visit this system. Our system can also work with our Central monitoring station. This model can also support keypad operation and 485 control port, so that it can control PTZ. You can use video cable or twisted pair cable(UTP) to transmit signal. We use video cable in this standard unit. PSTN/phoneline alarm function: auto dial 6 group of phone number during alarm, 10 second voice record, mute/sound alarm, anti-tampering function, Listen-in function, remote operation, built-in siren, built-in li battery, can work with 5 remote controls and 20 wireless alarm accessories. 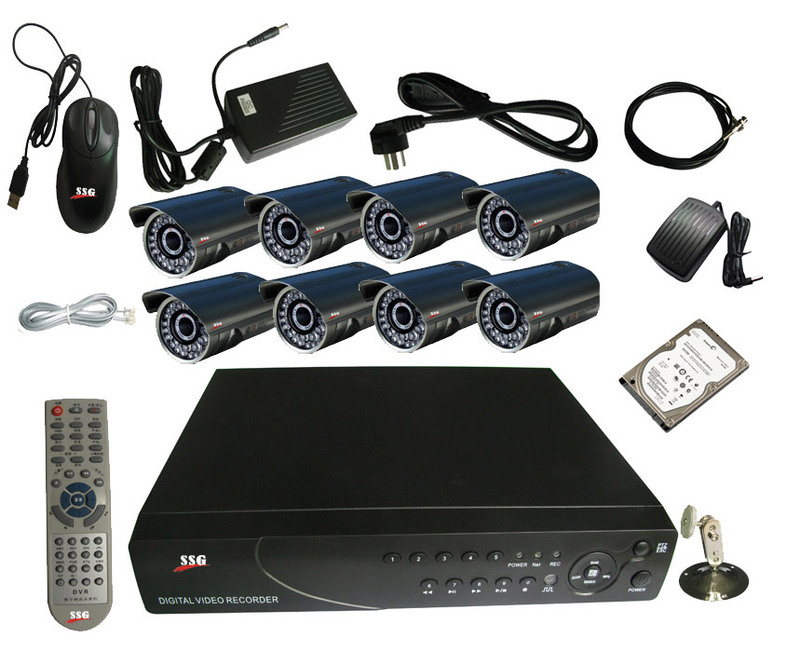 Standard unit: 12V3A power adaptor+SATA cable+user manual+Disk+mouse+bracket+remote control+certification+8pc CCTV cameras+8pc 12V 1A power adaptors+8pieces of 25 meters´ video cable+16pc BNC joint+8pc J05 bracket+ PSTN alarm standard unit (Built-in li battery+telephone line+keypad+built-in siren, learning code) Notice:Clients can choose suitable configuration according to his or her requirements. Network compatibility 10/100M10/100M self-adaption Ethernet port; Support LAN,WAN,3G and ADSL dynamic IP network. Alarm receiving method Wireless signal output, transmitting distance:≥150 meters. 1. Surveillance equipment and wireless alarm system: 2 in one! During alarm, user can use mobile phone(which must support one of the operating systems as follows:Windows Mobile .Symbian3.Symbian5, Iphone, blackberry, Android) to visit DVR. 2. Mini factory monitoring, all DVRs can use client software to monitor. 5. Villa monitoring, support video call alarm during alarm. 6. Base station, oil well monitoring. 8. Can work with CMS.